The welcome expansion of Klaus Tennstedt’s recorded legacy through the issue of live performances continues with this reading of Bruckner’s Seventh Symphony from Boston. This was a work that Tennstedt did not take into the recording studios though there is another live account, this time on CD, on the LPO Live label (LPO0030). That issue preserves a 1984 performance but I have not heard it. 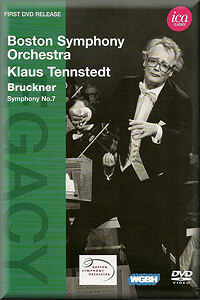 It was with the Boston Symphony Orchestra that Tennstedt made his US debut in 1974, when one of the programmes he offered consisted of Bruckner’s Eighth Symphony. By all accounts that performance had the critics in raptures. It appears from the booklet note that when Tennstedt gave three performances of the Seventh three years later the critics, who attended the first of the performances, were a little less impressed, praising the conductor’s interpretation but finding fault with some of the playing; it was suggested that perhaps the performance was under-rehearsed. By the time the third performance came round – the one preserved here – it would seem that these little difficulties had been ironed out. There are one or two very minor slips but the overall standard of playing is extremely high and one has the definite impression that conductor and players are as one. Oddly, the image on the cover of this CD is not taken from the performance we see. For this Boston concert Tennstedt eschewed a score and therefore had no need to wear spectacles. In fact the Tennstedt we see in this film is quite youthful-looking. The recording is presented in “Enhanced Mono” – I’m unsure what that means but the sound is perfectly satisfactory – so we don’t quite get the benefit of Tennstedt’s layout of the string section: the violins are massed on his left but the violas are to his right – where many conductors place the cellos – and the Boston cello section is seated to the right hand of the violas. The reading is a very fine one. Tennstedt moulds the long, expansive cello melody at the start of the first movement with great care and evident feeling. As the movement unfolds he takes the second subject quite swiftly, though he’s not too hasty. This performance is one of those that remind us that Bruckner was a musical descendant of Schubert – and Tennstedt was a fine exponent of Schubert’s Ninth. The listener is left in no doubt that Tennstedt has the measure of the span and structure of this movement. That’s even more the case with his account of the solemn Adagio. This is a noble, burnished reading and though Tennstedt maintains a good objective stance there’s no doubt that he feels every phrase. He shapes the music splendidly and the Boston players respond to him with playing of distinction. The strings are wonderfully rich in tone, with just the right amount of weight, while the brass are sonorous. This is one of those performances where everything just feels right – and inevitable. The cymbal and triangle are included at the main climax. Tennstedt ensures that the rhythms of the scherzo have real lift and spring while the lyrical trio is affectionately phrased. The finale is completely successful. Tennstedt mixes energy with expansive phrasing and the brass-dominated episodes are delivered with due majesty. Tennstedt’s rendition of this symphony is deeply satisfying and it’s marvellous to have an example of him at work with one of the finest orchestras in the USA. We’re told that he worked regularly with the BSO until 1987 so I hope very much that ICA may be able to license more material, either audio or visual, from the orchestra’s archives. I found it fascinating to look at the BSO of thirty-five years ago and I noted with some surprise how few female musicians there were on the stage – possibly eight at most, including the orchestra’s celebrated principal flautist, Doriot Anthony Dwyer. Furthermore, at that time there don’t seem to have been too many young players in the BSO’s ranks. I bet things have changed quite a lot in the intervening period. The thing that really matters is that the Boston Symphony of 1977 vintage was a fine, seasoned ensemble and it’s a joy to hear them play under this great conductor. The visual presentation is reliable and gives a good representation of the concert. One minor irritant, I found, was the director’s occasional propensity for split-screen shots, showing us, for example, the principal oboist in one half of the screen and the principal clarinettist in the other. Happily, this doesn’t occur too often and it may not bother other viewers. The key thing is that if you invest in this DVD you’ll acquire a top-quality performance of Bruckner’s Seventh under a great conductor.